Louis Franklin Quint, son of Jotham Sewall Quint and Mary Parker (Tufts) Quint, was born on a farm near Nauvoo, Illinois the 17th of July 1852. His mother was a direct descendant of the Tufts family who founded the Tufts College, now well known Tufts Medical School, at Malden, Massachusetts in 1852. Through another line she was a direct descendant of Isaac Allerton who came over in the Mayflower to America in 1620. When Louis was four years old his mother died, and later his father remarried. He grew to manhood on the same farm on which he was born and received his common school training in the same neighborhood, later attending the Ft. Madison Academy and teaching school for one year. He married Isabel Flora Jackson at her home in the same neighborhood on March 9, 1876. They started housekeeping on the farm where he was born, later moving to Iowa, then to Nebraska. 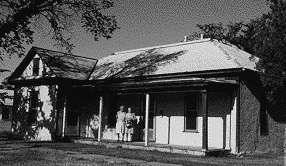 In the spring of 1884 they moved to Mitchell County Kansas where they purchased a farm, living there until the spring of 1902. In 1901 Louis and his oldest son, Clarence, made a trip to Graham County, Kansas in search of more land. At Hill City they met Mr. Gantz who had Mr. Howland show them land one mile south and two miles east near the Solomon River. This farm was to their liking and they purchased 320 acres. The land was unimproved with only a two-room dugout for living quarters. However, in the spring of 1902, Louis and Isabell moved with the family, six girls and two boys, by way of covered wagon, to Graham County and lived in this house until they could build a more suitable house. Having grown up in a land where the trees were abundant, Louis missed the trees. One of his first projects was to pull one hundred cottonwood saplings from the banks of the Solomon River and start a grove west of the house. Years later he was so thrilled to find a squirrel in his grove to further remind him of the trees in Illinois. 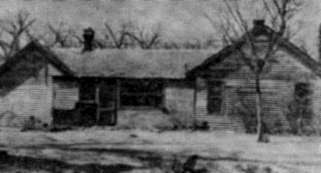 Photo of Quint farmhouse before being replaced in 1962. The addition on the left was added in 1913 for Gandma Jackson. Mr. and Mrs. Quint were known as good neighbors and citizens wherever they lived. They were industrious, friendly and always interested in the betterment of the community. Both had taught school and were always interested in education. They always believed in having good reading material in the home and for years subscribed to "The Youths Companion" which all the children enjoyed. In Graham County Mr. Quint served in various offices in Millbrook Township, and was assessor for the township for several years. He was always a member of Highland School District #78 as long as he had children in school, and always had time to work for the best teachers they could hire. He was always ready to help his daughters acquire teaching certificates and apply for schools for the coming term. All six of their daughters followed the tradition of the family by teaching school. The two sons became farmers, as did their sons. Mr. and Mrs. Quint's example and teaching regarding honesty, fairness and dependability are lessons that made a lasting impression on the minds of their children. In 1924 Mr. & Mrs. Quint moved into Hill City in their home on North 5th Street. Here they set out a number of peach trees and for several years reaped a good harvest from these trees. Photo of L.F. Quint home in Hill City.